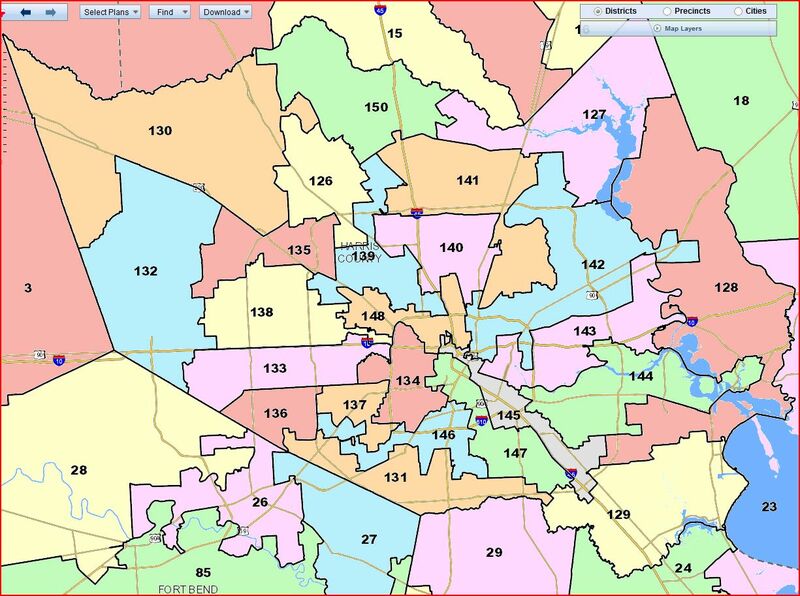 I know it will break your heart to hear that Harris County GOP Chair Jared Woodfill is a little peeved at Greg Abbott and Steve Munisteri because he thinks the Abbott map makes Harris County too Democratic. 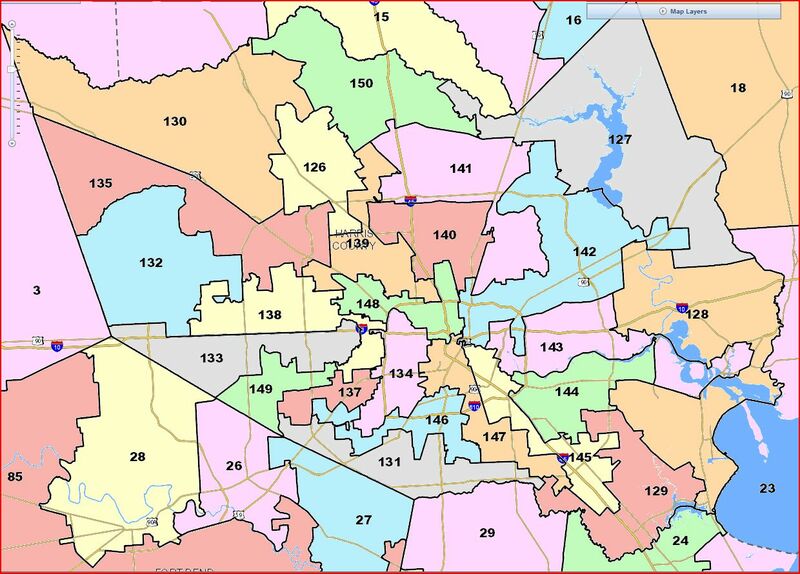 What got Woodfill going was Munisteri’s willingness to go along with a map Abbott produced that would cost Harris County Republicans two seats in the state House. “Local Republicans feel like we’re being sold out,” Woodfill told me. 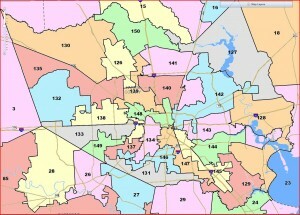 His Saturday e-mail — “a respectful e-mail,” he called it — urged Harris County Republicans to contact Munisteri and Abbott to register their objections to the map. “Unfortunately, my reasonable request has been met with finger-pointing, reassigning blame and simply passing the buck,” he wrote in a subsequent e-mail Monday morning. By Monday afternoon, things had gotten testier. “This thing has blown up into a war,” he said over the phone. “We’ve worked to long and too hard for this to happen,” said Woodfill, who also said he had received hundreds of e-mails in support of his no-surrender stance. 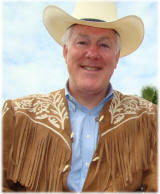 Paul Bettencourt, Dr. Steven Hotze, Allen Blakemore and other conservative stalwarts were urging him on, he said. You can see more of the email squabbling here and here if you’re into that sort of thing. Far be it from me to defend Greg Abbott, but I feel pretty confident that he wouldn’t yield any ground he didn’t think he was certain to lose anyway. He certainly doesn’t care about the best interests of any Democrat. But hey, don’t let me stop you from stocking up on pitchforks and torches, Jared. You go on with your bad self there. If Woodfill et al don’t like Abbott’s proposed interim map, they surely aren’t going to like the map proposed by the non-MALDEF plaintiffs, which is Plan H307. Here’s a little comparison of the numbers for districts of interest in that plan (full data here) with those from Plan H303, the Abbott plan (full data here. The above represents all of the Democratic districts in which changes were made, the districts that become Democratic (or at least Democratic-leaning) as the result of changes, and a few other related districts that show where all the Republicans were relocated. Some of these changes are simply the result of renumbering. 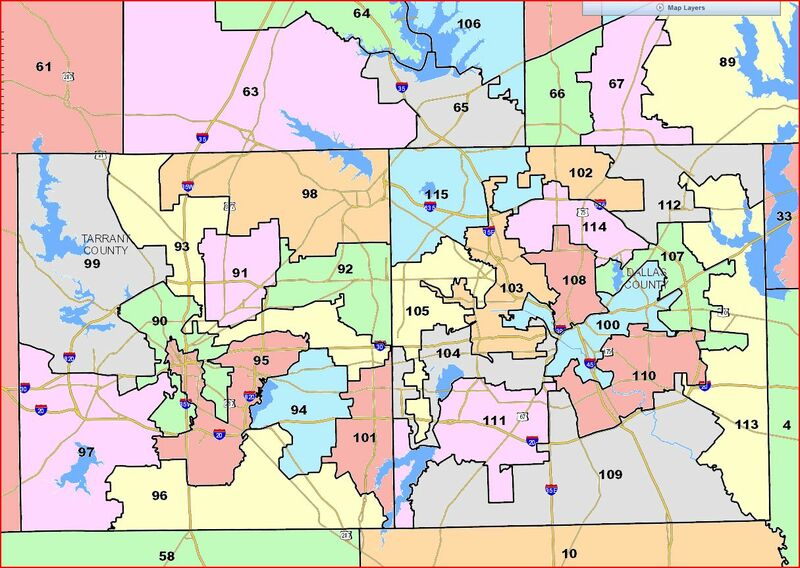 HD101 becomes HD113 and vice versa in Plan H307, while Hubert Vo’s district is HD136 in H303 and reverts back to HD149 in H307, with HD136 becoming the new Williamson County district. 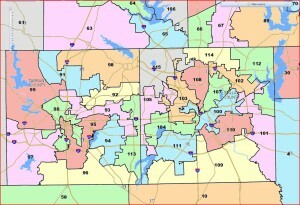 (Districts 30, 33, and 34 were shuffled around with no precinct changes made, just the labels.) You can see some pretty big changes, however, which would likely result in at least another 3 or so seats for the Dems. Districts 26 and 93 come (back) into play, while districts 102, 105, and 107 go from lean/likely R to lean/likely D. Most surprising to me is HD132, which remains a west Harris County district but shifts radically in partisan performance. I don’t have CVAP or SSVR numbers, but I’m guessing it’s a lot more Latino in the plaintiffs’ plan. That one I didn’t see coming. If all that’s not enough for you, here’s 2008 electoral data for the two Congressional plans submitted by the NAACP, PlanC232 (map here) and PlanC233 (map here). Both restore CD25 for Lloyd Doggett and give three of the four new districts to Democrats while making Quico Canseco’s CD23 a tossup/lean Democratic district. PlanC232 makes Smokey Joe Barton’s CD06 a tossup/lean Republican district, while PlanC233 makes Ken Marchant’s CD24 a lean/likely Democratic district. 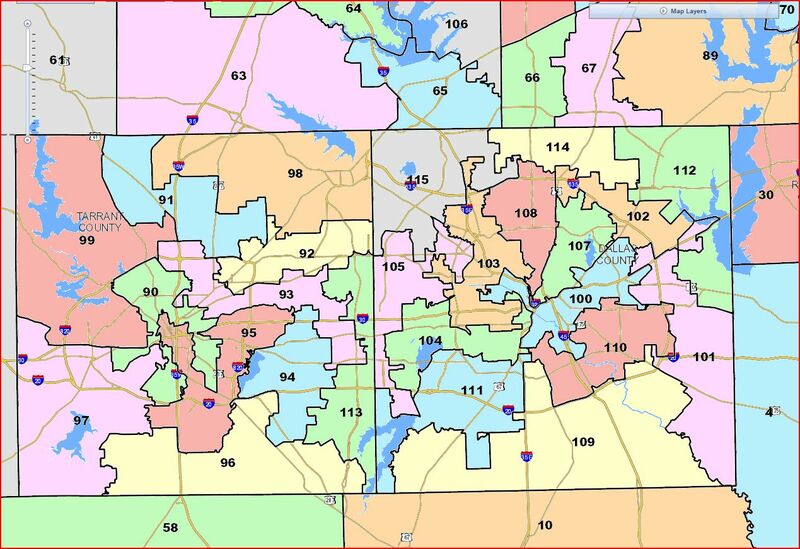 As CD14 remains the same in each and in the Abbott map, that means Dems would likely win between 12 and 15 seats under C232 and between 13 and 15 seats under C233. None of this may ultimately matter, of course. The parties could come to some other agreements, an outcome that looks increasingly remote right now, except possibly for the Senate. The San Antonio court could decide that the Abbott maps are good enough. Alternately, the San Antonio court could wait for the DC court ruling despite its seeming insistence on coming up with something in time to salvage an April primary and then draw something completely different. Who knows? Actually, at this point, any hope for an April primary is all but dead, and we have less than three weeks to get maps in time for a May 29 primary. I suspect that somewhere in all of these pieces is most if not all of the final puzzle. It’s making they fit together that’s the hard part. See Michael Li’s live Twitter feed for the blow by blow of yesterday’s hearing, which will continue today. Greg has more. UPDATE: Michael Li summarizes the day’s activity. 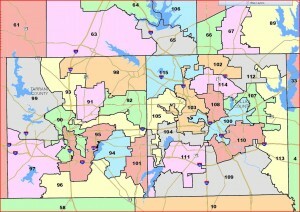 Steve Munisteri, chair of the Republican Party of Texas, told party members last week that, if the court-drawn interim maps stand, he would seek to have Republican candidates for the Texas Legislature pledge to take up redistricting again in the 2013 legislative session. You can read his full statement here if you want to – it’s mostly a bunch of chest-thumping and judge-bashing. The Republicans have already established a precedent of re-redistricting when it suits them, so like I said, no one should be surprised by this. The fact that Steve Munisteri wants it to happen – in the event that SCOTUS doesn’t soothe their hurt feelings, of course – doesn’t mean that it will, of course. It took a lot of pushing from Tom DeLay for the 2003 do-over to happen. Joe Straus and whoever gets elevated to Lite Guv in David Dewhurst’s place have to want it to happen. Enough Republicans who feel confident that their own districts won’t get screwed over have to want it to happen. The ruling the DC Court ultimately renders in the state’s preclearance lawsuit has to leave room for them to do something. I’m not saying it can’t or won’t happen, just that this is one of those times when the crystal ball is a little too murky to make a prediction with any level of confidence. Burka has more.